We’ve all been there: pulling an all-nighter in an energy-drink-fueled haze of stress and sleep-deprivation trying to pump out that paper due in 5 hours. On those nights, eye-strain is the last thing you need to compound the situation. And because most of us have one or two roommates – and perhaps not the convenience of another place to work – we have to work with the lights off. 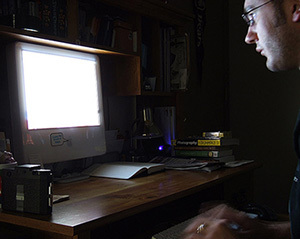 The thing is, staring at a well-lit screen in a dark room is the exact thing that causes eye-strain. But not only that: a study  done by the National Sleep Foundation has found that the use of bright, interactive technologies like the computer may disrupt the sleep-onset process. The application f.lux  is designed to alleviate those problems. It changes the color of your monitor depending on the time, from bright in the day to warm at night. The degree and rate of the color shift can be modified for both day and night. It can also be disabled at any time for those art projects that require accurate color display.